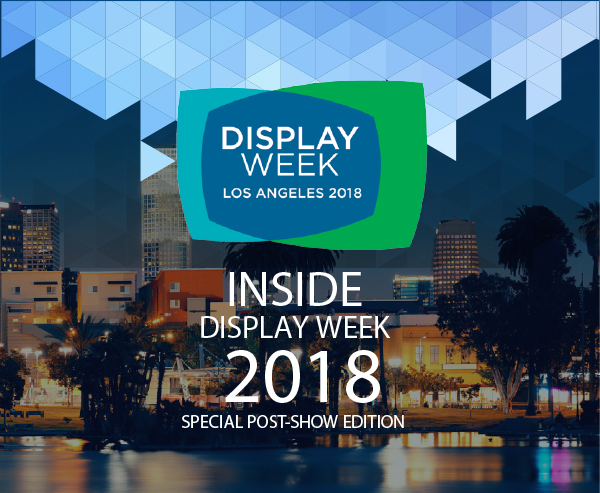 Welcome to a special edition of Inside Display Week 2018 - filled with highlights from the world's largest exhibition for emerging electronic information display technology. 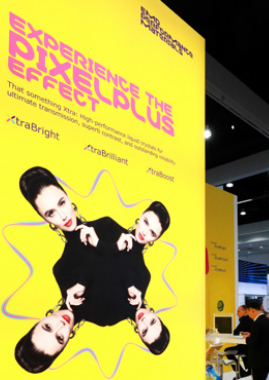 Display Week 2018 outshined the stars when nearly 7,000 attendees flocked to the Los Angeles Convention Center to see the newest products taking the world by storm, learn about what's coming next and rub elbows with some of today's top technology visionaries. More than 200 exhibitors showcased their latest and greatest, the Innovation Zone (I-Zone) packed two large dedicated areas with prototypes and demos never seen before, the keynote sessions overflowed with inquiring minds, and the Technical Symposium, educational courses and business conferences delivered as promised by providing key intelligence about this ever-changing industry. 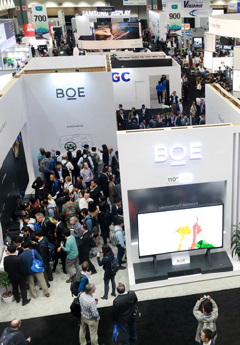 Displays for applications such as auto, AR/VR, AI and wearables, and emerging displays like flexible OLED, reflective ePaper and microLEDs were but a few of the eye-popping exhibits engaging the crowds. "We scheduled Display Week for the worldwide premier of our new simulated reality technology demo, system and developer kit," said Arne Balk, Brand Marketing Director, Dimenco. "This was our busiest event yet! We saw so many VR/AR content creators and OEM prospects - from commercial and industrial, to entertainment, medical and military. The reaction and interest has been incredible!" Kyle Benkendorfer, CEO of X-Celeprint, echoed these sentiments. "SID's Display Week was an absolutely incredible experience for us, we were inundated by the number of business and technical meetings we had," he said. "For a new microLED display technology like ours, there is no better place to get feedback from the experts in the industry." The Society for Information Display (SID) also bestowed its annual Honors & Awards for distinguished contributions to the field; and recognized outstanding efforts at the Display Industry and Best in Show Awards. Adding to the festivities was Display Week's special networking event at the California Science Center, where attendees had the chance to wine and dine with technology pioneers and colleagues from around the world. Scroll down below for highlights and links to the official videos from this fantastic event, or see the entire playlist. But before you do: Mark your calendars for Display Week 2019, May 12-17, 2019, in San Jose, California, when we'll saddle up in Silicon Valley for another exciting ride on the technology trail. 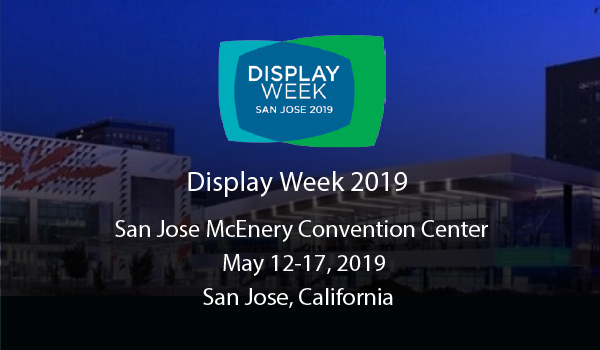 "We will be at Display Week 2019 in San Jose. This is really a wonderful show for us, and we can learn more from the show and show more of what we can do for customers. Display Week will do better and better in the future." "While Review Display Systems is a wellestablished and well-known company in the UK, we took the decision to expand our business into the USA by opening RDS Inc. in Milwaukee in April 2018. By means of launching RDS Inc., we took the decision to exhibit at SID Display Week in Los Angeles. This proved to be a great decision, it was a really great show for us, connecting with high quality design, electrical and mechanical engineers, who recognized the quality of our bespoke display and embedded systems. Each had different peripheral application requirements that we could satisfy. We look forward to participating in Display Week next year in San Jose!" "At Display Week we spoke with many customers and prospects interested in our advanced polymer solutions for their application needs. We saw the right target audience of chemists and materials engineers we needed to see at Display Week - many from Fortune 100 companies." "Display Week is a great event to engage all the various engineers that can use custom Lummax Electronics' LCD, PMOLED and AMOLED products  electrical, electronic, optical and development engineers. We met many key industry players." "Display Week was a fabulous show for TOYO Corporation. We've been involved with the display industry for decades in Japan. But this year, to reach a global audience, we officially announced our new LT1000 ion impurity measurement system here at Display Week. We talked to many panel design engineers and technicians who were absolutely amazed with the instrument's ability to deliver complete and accurate test cycle measurement results, with full data, in one second - for organic and inorganic liquid-based substances." Now's the time to reserve your space! 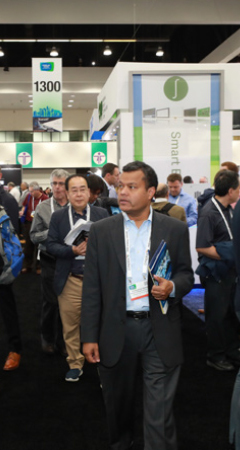 Display Week 2019 will offer an expanded exhibition floor and create more opportunities to showcase innovations, breakthroughs, new products and demos. More than 80% of the floor space is sold, but there's still room to grab a great spot! Email Jim Buckley (Americas and Europe) or Sue Chung (Asia). Display Week 2018's keynote addresses drew more than 2,100 attendees and a standing-room-only crowd when industry luminaries took the stage on May 22 to discuss today's hottest technology trends. Learn more about the fascinating topics discussed by clicking on the links below. "OLED Leading to the New Experience of Display"
"Reactive Displays: Unlocking Next-Generation VR/AR Visuals with Eye Tracking"
"Blue LEDs and Transformative Electronics for Developing a Sustainable Smart Society"
During this second annual gathering, an all-star panel of women in the field shared their unique insights and experiences, and shed light on what it takes to succeed. Robinne Burrell, Chief Digital Product Officer, Redflight Mobile/Redflight Innovation, noted that retaining successful women at technology companies is a major issue, and that having mentors has been critical to her career. "Once women have made it past STEM [science, technology, engineering and mathematics], and they have these great careers and these great positions - hanging on to them is really tough because once they get there, they're in this kind of power struggle," she said. "And it's so hard once you get there to defend your space and command respect in a male dominated industry. It's so critical to have a mentor within these organizations to keep you there." 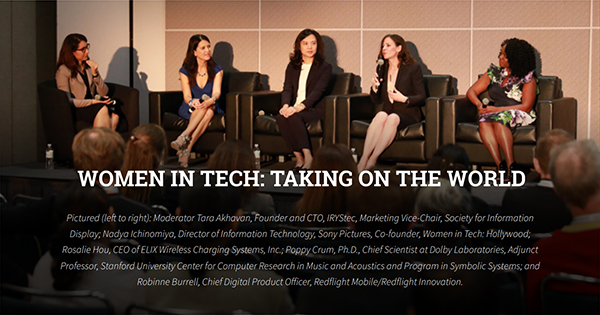 See the entire session of this fascinating discussion, which also included Poppy Crum, Ph.D. Chief Scientist at Dolby Laboratories, Adjunct Professor, Stanford University Center for Computer Research in Music and Acoustics and Program in Symbolic Systems; Rosalie Hou, CEO of ELIX Wireless Charging Systems, Inc.; Nadya Ichinomiya, Director of Information Technology, Sony Pictures, Co-founder, Women in Tech: Hollywood; and Tara Akhavan, Moderator, Founder and CTO, IRYStec, Marketing Vice-Chair, Society for Information Display. You can also check out their individual interviews by clicking on the links above. The 2018 Women in Tech event was sponsored by CLEARink and Microsoft. Passion, productivity and tenacity were the themes of the day during the debut of Display Week's CEO Forum, when top executives discussed the road to success. "There's certainly a fire of wanting to do something, but the other part is you have to hate the notion of failing," said Dr. Helge Seetzen, CEO and General Partner, TandemLaunch, and President of SID. "Not in the sense of when you fail....which you ultimately will along the way - but out of pure stubbornness and unwillingness to accept the bad result, you just power through it, fix things, pivot, do whatever it takes." Watch the video of the full session to hear more insights from Dr. Seetzen and other industry thought-leaders, Frank Christiaens, Chairman and CEO, CLEARink Displays; Paul Travers, Founder, President and CEO, Vuzix; Ross Young, Founder and CEO, Display Supply Chain Consultants; and Sri Peruvemba, Moderator, CEO, Marketer International, and Board Member, Society for Information Display. You can also see their individual interviews by clicking on the links above. Display Industry and Best in Show Awards are bestowed annually by the Society for Information Display to recognize the best display products or applications introduced to the market in the previous year. In addition to the awards ceremony, this year's luncheon featured David Yu, senior graphics software engineer with Pixar Animation Studios, who spoke on "Real-Time Graphics at Pixar for Animated Feature Film Production." Mr. Yu's talk examined some of the latest animation techniques in use at Pixar and how those techniques fit into the past, present, and future of real-time graphics technology. Now in its 7th year, Display Week's I-Zone is fertile ground for inventors, universities and start-ups to showcase their pre-market demos and prototypes to thousands of attendees, including potential partners, manufacturers and investors. I-Zone exhibitors are chosen through a competitive process and the competition winners receive free space on the exhibition floor for three days. In 2018, more than 50 projects were chosen to be a part of the I-Zone. 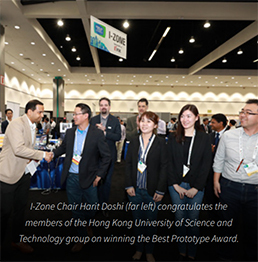 "I-Zone submissions come from all over the world and we're very happy to provide this platform to our global community," said I-Zone Chair Harit Doshi. "The selection process is difficult, because we see such great technology being born, but it's well worth it to bring the latest and greatest technology to the show." Every year, one product in the I-Zone exhibition is chosen to receive the "Best Prototype Award." The 2018 winner is Hong Kong University of Science and Technology, which developed a 250-pixel-per-inch (ppi) active-matrix field-sequential color-display panel based on electrically suppressed helix ferroelectric liquid crystal (FLC). FLC's fast response time of 10 microseconds under low voltage of 6.67V/micron enables field sequential color display operation with a 60-Hz frame rate and 360-Hz FLC driving frequency. See the technology. The special session, "Pioneering the Trail to Today: 50 Years of LCD Innovations," focused on the innovative R&D work and commercialization of the LCD, which opened up the new era for small to large display-related products. The event also included a special 80th birthday celebration for LCD TN inventor Martin Schadt, who was joined during the discussion by Fang-Chen Luo, Adviser, AU Optronics; Koji Suzuki, former CTO, Toshiba Corp.; Kenji Okamoto; In-Jae Chung, former CTO, LG Display; Jun Souk, former CTO, Samsung; Dr. Mark Verrall, Sr. Vice President, Research & development, Merck; Terry Scheffer, LCD Consultant; and Dr. J. William Doane, Co-Founder andSenior Advisor, Kent Displays, Inc.
One of the cornerstones of Display Week, the annual Technical Symposium includes scientists, inventors, academics, researchers and business leaders from around the world. This highly anticipated and well-respected forum offers a rare opportunity to learn about state-of-the-art advances from industry luminaries not often seen in one place together. The 2018 event attracted nearly 700 submissions, and included nearly 100 invited papers featuring the latest discoveries, insights and forecasts in the four special topics that were focused on emerging technology in these areas: artificial intelligence and augmented and virtual reality: quantum dots and micro-LEDS; and wearable displays, sensors and devices. Display Week 2018's Special Networking Event, sponsored by BOE, went off like a rocket - or like the Space Shuttle Endeavor, which towered above a festive catered affair at the California Science Museum. Attendees, exhibitors and industry icons from around the globe connected during this exciting annual gathering - which is almost as well-known as Display Week itself! Whether walking through a live ecosystem with nearly 400 species of live plants, being fascinated by spacecraft that once took flight or taking in the unique exhibition of how technology is completely embedded in just about everything we see and touch, it was a night to remember under the heavens in the City of Angels. Every year, Display Week's annual Business Track offers several outstanding conferences that get inside the world of displays and show you how to navigate the marketplace of this $100+ billion industry. These day-long sessions feature multiple presentations from global experts who share the newest thinking and cover the full spectrum of what you need to know about the business end of the display business, and how to thrive in a highly competitive, rapidly shifting environment. Our exclusive conferences were the place to be this year, whether attendees wanted to find out about the outlook for the smart phone and TV markets, the technologies enabling next-gen displays, what's driving the auto tech industry, what investors are looking for or successful supply chain management. And - because Display Week is committed to showing the latest advancements in the field - this year's Business Track took a deep dive with its Immersive Experience Conference that focused on key elements of one of today's most important emerging arenas. Topics included the status of the market, delivery mechanisms from goggles similar to what is on the existing market and what's on the horizon, and the new requirements that are a superset of today's resolution, response time, CR, luminance, etc. Display Week's Business Track is presented in conjunction with Display Supply Chain Consultants (DSCC), and features the field's top market, technology and financial analysts. If you want to stay ahead of the competition, don't miss Display Week 2019! In addition to our annual Press Breakfast, which provides an exclusive preview of the Display Industry Award winners and exhibition highlights, we hosted a major announcement by Dimenco about their new simulated reality product. Press coverage is expected to continue year round leading up to Display Week 2019 in San Jose, California. We look forward to seeing you there!